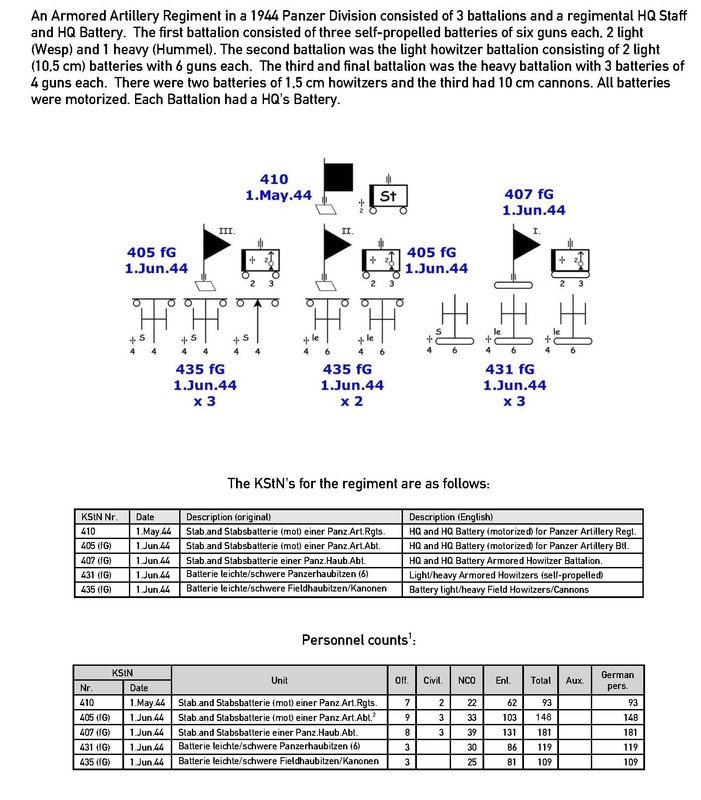 In our last blog entry we begun to research information on the component units of the 6. Panzer Division along with where and when it saw action. Divisions are large organizations, a conglomerate of a range of specialist units. This blog post aims to show how we take these various components and build out their structure as accurately as we can. With our overall information determined, the next step is to look at what I have in my library from the German Archives. In the Pub T-78 (OKH), roll 617 there are records of the all the Panzer Divisions for November and December of 1944. Although the listing is for 1.12.44 I am close to the date I want to review. 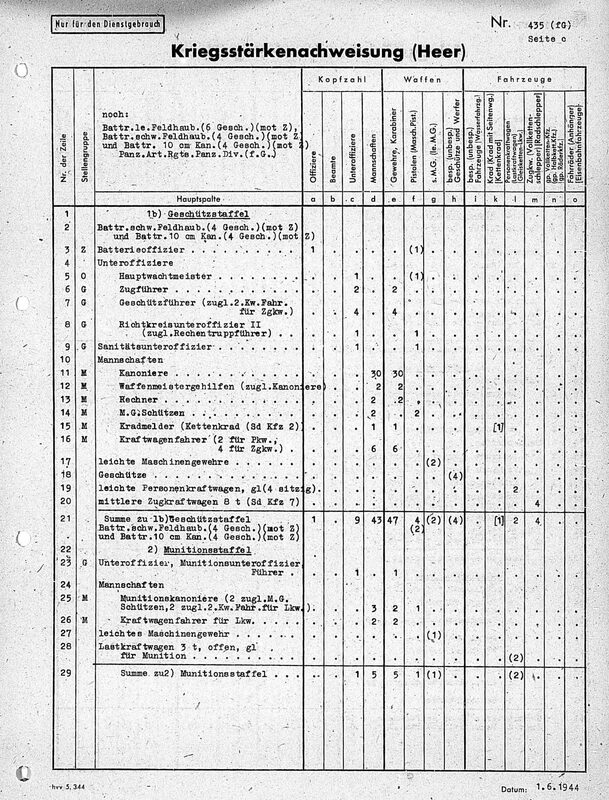 In the same group of documents I find the strength report for 24.12.44 – also mentioned in the Fire Brigade book so I can now verify my data. 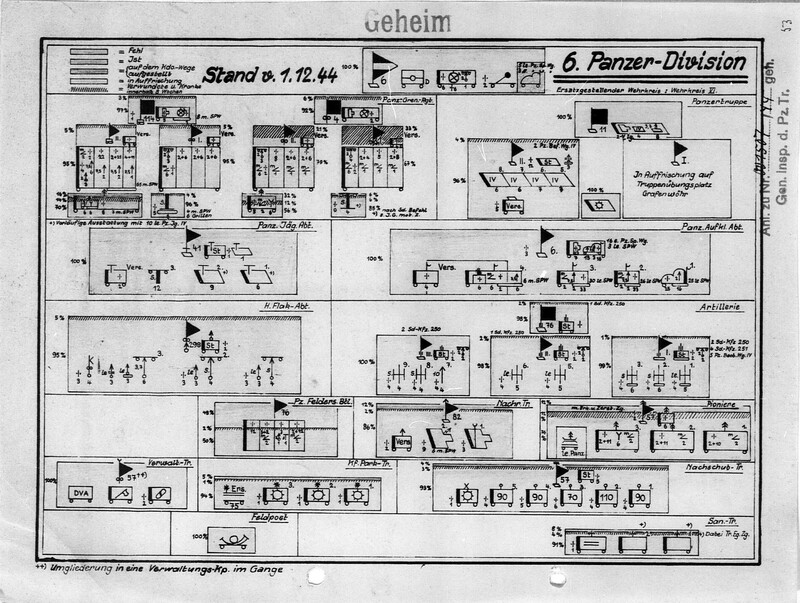 This below schematic is a kriegsgliederung (war outline, order of battle) and having one of these for your units dated at a specific date is golden. It shows the entire division structure and equipment on hand for the date listed – in this case “Stand 1.12.44”. As you can see on the side of the image these were sent to the “General Inspector of the Panzertruppen”. It shows there are 3 battalions I, II, and II from right to left. 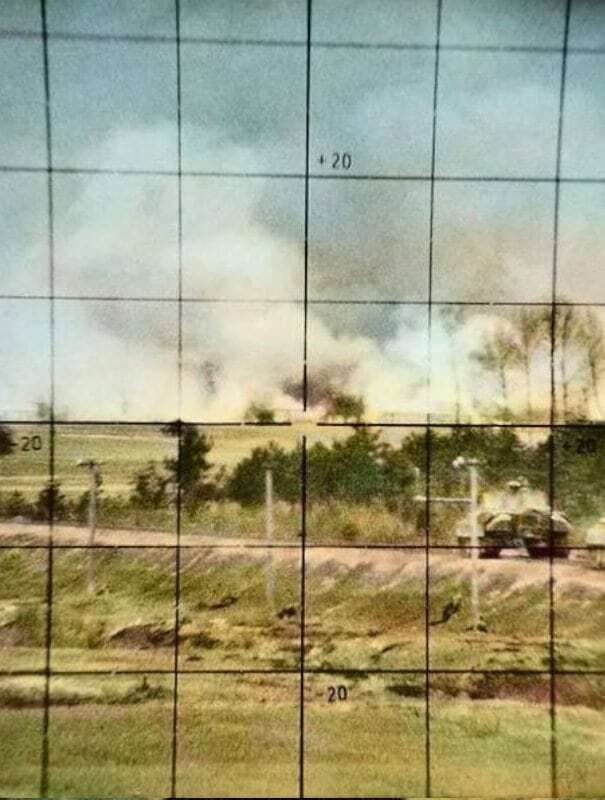 The first battalion has battery 1 with 5 light (le) self-propelled howitzers (10.5cm Wespe), while batteries 2 and 3, consist of 6 heavy (s) self-propelled howitzers (1.5cm Hummel). This is not the standard TO&E for the battalion which should have had 12 Wespe’s and 6 Hummel’s. The II Battalion has batteries 5 and 6 with light towed howitzers (10.5cm) with 5 in each battery. And finally in the III Battalion there is battery 7 with 4 x 10cm cannons, and batteries 8 and 9 with 4 heavy towed howitzers (1.5cm) in each. Also shown is that each battery has 4 light machine guns and each battalion HQs has 2 x 2cm towed flak guns along with 2 light machine guns. We build our order of battles with the units at full TO&E strength and then reduce them in the scenario. So for the full strength of German units we look to the the K.S.t.N. 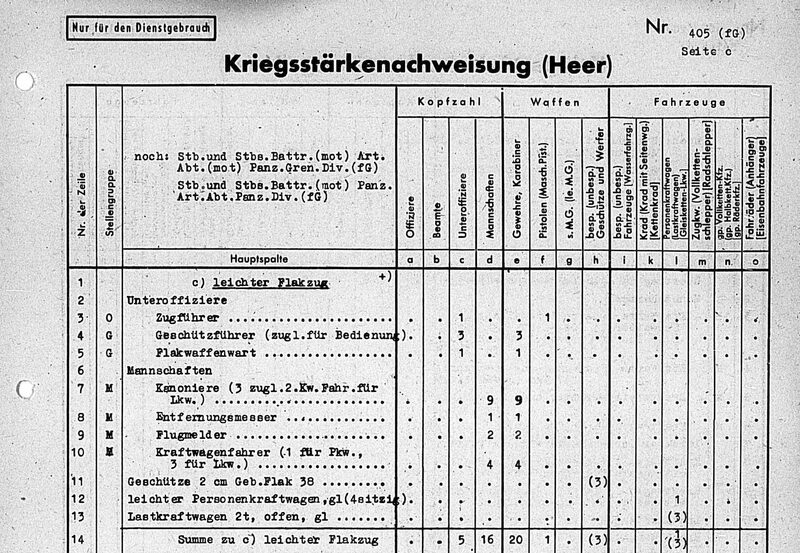 (Kriegsstärkenachweisung) or wartime table of organization and equipment. The Germans issued new KStN’s for the panzer divisions in June of 1944. Sturmpanzer.com has been putting together the late war KStN’s of the infantry and panzer divisions and selling them on line, making it easy to have the full set of KStNs for a division all in one place and organized by sub-unit. 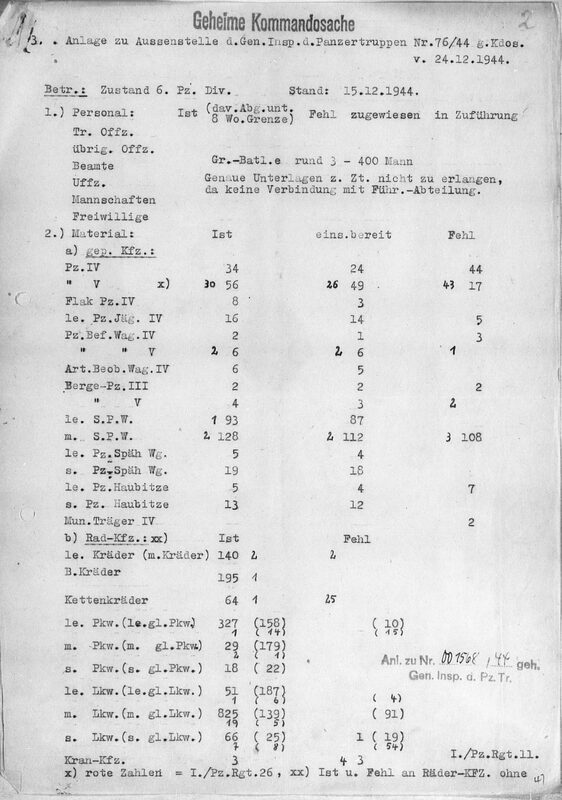 Line 18 list the guns (4), while line 20 lists the towing vehicle (4 Sd Kfz 7), and line 21 lists a summary of the gun battery. 1 officer, 9 NCOs and 43 men, with 47 rifles, 4 pistols, 2 machine pistols, and 2 light machine guns. The flak platoons and the light howitzer batteries will be reduced to the current fighting strength in the scenario editors. In the next blog entry we will look at the Armored Panzergrenadier Battalion at the same level of detail.